Most of our bus fleet offers easy access as well as services for hearing, vision and mobility impaired users. 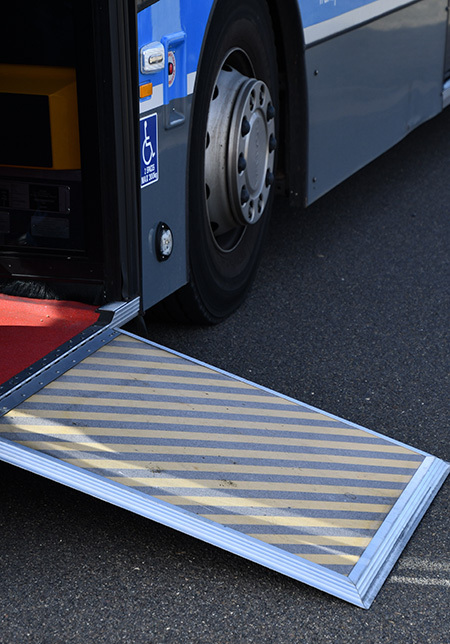 We’re working to make all buses wheelchair accessible by 2022.
space in the bus to accommodate wheelchairs or prams. Please ask the driver to put down the ramp or lower the bus as appropriate for you to get on and off the bus. Check on the timetables or NXTBUS for the easy access symbol. If you need a wheelchair accessible bus on your regular bus route, register your request and provide your name, address, bus route and preferred time of travel. Where possible, we will make every attempt to meet this request, or consider it for future network planning. We’re committed to making information and services accessible to as many people as possible. Translating: If English is not your first language and you require the translating and interpreting service, please telephone 13 14 50. Hearing impaired: If you are deaf or hearing impaired and require the TTY typewriter service please telephone (02) 6207 7689. We also have a teletype (TTY) service for the hearing impaired in our Customer Service Centre, please call (02) 6207 0494. Vision impaired: We offer free travel for vision impaired passengers and their attendant. Our bus stations and frequently used bus stops have tactile paving, audio announcements, with some bus stop number plates in Braille. Guide dogs are allowed on buses. You can also request a bus hailing kit from Vision Australia. Canberra Blind Society and Guide Dogs Australia or contact us. Alternative formats: If you have difficulty reading a standard printed document and would like to receive the publication in an alternative format such as large print, braille or audio, please contact us. This website: Find out about our commitment to website accessibility. Use NXTBUS to check if the next bus is wheelchair accessible. Bus hailing kits can assist vision impaired people to catch buses. The kit has a clear plastic pouch with three slots and a set of numbered inserts, which used together display the required bus route number to bus drivers. The inserts have large, raised print and Braille to help with identification. These kits are available from Vision Australia, Canberra Blind Society and Guide Dogs Australia or contact us. Please be aware that some oversized wheelchairs and scooters will not be able to board. Download Safer travel for passengers using Mobility Aids on Public Transport (PDF 460KB). The MyWay on-bus card readers are positioned at a relatively low height to support mobility access requirements.